It’s been about two weeks since the Superior Arts Business Improvement District took effect, which aims to bring economic development and renaissance to the area from Payne Avenue to St. Clair Avenue (between E. 18th Street and E. 26th Street) in the Campus District. Already, the Downtown Cleveland Alliance’s Clean and Safe ambassadors have been at work, picking up trash and patrolling the streets. There is an undercurrent of pride running through the city’s historic garment district, led in part by GBX Group (formerly global X), which specializes in managing investor funds for historic renovations. In March, GBX moved its headquarters from the historic Edwin Hotel at 1303 Prospect Ave. East to the Empire Improvement Building (known to many as the Daffy Dan’s building) at 2101 Superior Ave.
GBX has spent the past 18 months renovating the 1913 Keetch Knitting Mills clothing warehouse and retail outlet. 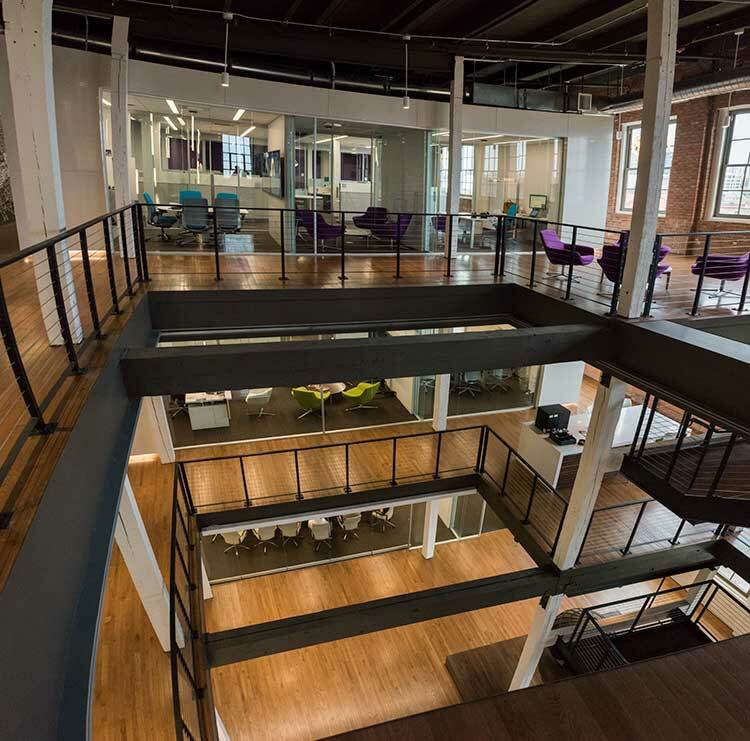 While 100 years ago the building housed heavy, iron sewing machines, operated mostly by women, today GBX has transformed the upper three floors of the five-story building into its state-of-the-art headquarters, with equally-modern office rental space on the lower two floors. 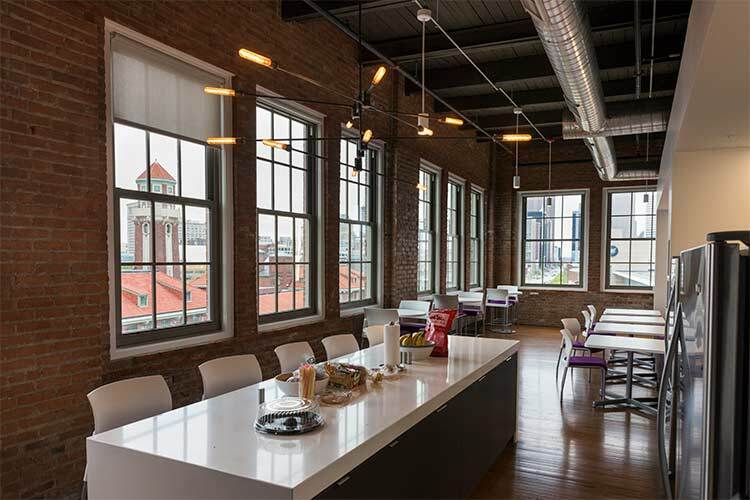 The completed GBX renovation effectively marks the beginning of a new era in the Superior Arts District, as GBX officials hope to lead by example with seeing the possibilities in Cleveland’s historic garment district. “One of the things that was determined early on is that we kind of had to lead the parade,” says David Swentor, GBX’s president of real estate, of the company's intention to spearhead the development in the Superior Arts District. “We had to stick a pole in the ground and rally around it, and that [pole] was this building. It’s been remarkable to have a parade of people coming in, and for the first time, understand the opportunity that is Superior Avenue—looking through these buildings and say, ‘Something like this can be created in the old warehouse space.’ We needed to demonstrate it and prove it first." Only two tenants—Crushtone Studios and Daffy’s Dan’s—were in the building when GBX purchased it, so the company facilitated the move of Crushtone Studios from its former 2101 space to the renovated building at 2230 Superior that now houses the collaborative Superior Sound Studios. Company officials spent nearly two years procuring state and federal historic tax credits, an historic easement, and a grant and loans from JobsOhio for the $12-$14 million project. Additionally, the City of Cleveland provided GBX with tax abatement—even though it’s a commercial building—for the potential jobs created. The company has 40 employees and is adding staff every day. GBX president of community development Antonin Robert says all building renovations were done according to National Park Service’s historic preservation standards, with some give-and-take occurring on both ends. They had to move the entrance from the front to the back of the building in order to meet ADA standards and install a wheelchair ramp. All interior renovation work was done based on old photographs, with Sandvick Architects consulting on the building’s historic preservation, and Vocon serving as interior architect. Krill Construction was the general contractor, while Panzica Construction served as construction manager. GBX was meticulous in its renovations. “We had to be careful. We couldn’t do drop ceilings near windows, [and] the mechanicals have to be a certain height and distance from the windows,” Robert explains. The new windows are clear glass and able to open, which Robert considers the best feature of all. Since the north-facing side of the building has no windows, much of that space is dedicated to mechanical equipment and cabling. 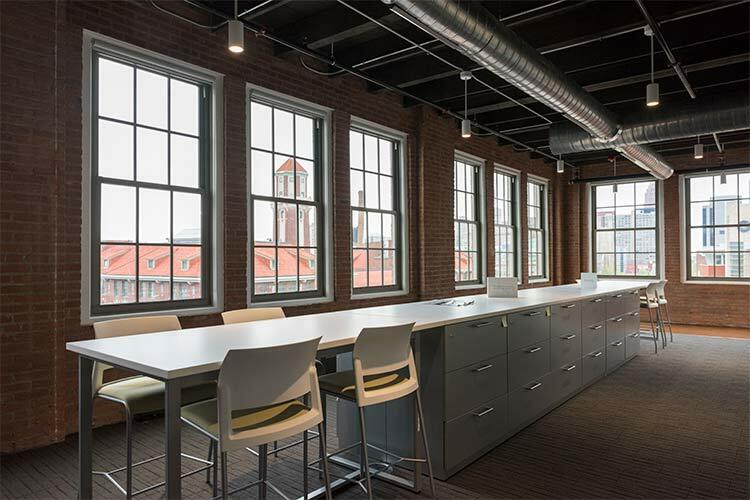 Every level of the new GBX offices is designed with an open floor plan, flowing with natural light and conducive to collaboration. An open atrium with a center staircase is designed to make employees feel unified, instead of separated by different divisions on different floors. The original elevator was not up to code, so designers fashioned the old cargo elevator into the main elevator. “They built a shaft within a shaft to be able to replace the old elevator,” says Robert. A large, metal vintage fishing buoy adorned with GBX’s “X” logo grounds the atrium, and other vintage Cleveland industrial machinery—sourced by Cleveland Art and then fashioned into furniture—serve as bases to tabletops and furniture throughout the meeting rooms. GBX’s three floors are defined by giant chalkboard murals, painted by Cleveland illustration artist Lisa Quine. The main floor mural depicts information about GBX; the next floor up lists facts about the history of the building; and the top floor mural maps the Superior Arts District. Open group meeting areas feature interactive screens that can broadcast from any computer and entire walls made of whiteboard material so that employees can collaborate and brainstorm. Even the lunchroom is open and airy, with GBX providing lunch meat, snacks, and fresh fruit—not to mention an upscale coffee machine that will brew just about any hot beverage. “The biggest concern our staff had in terms of the move [was], ‘Where am I going to get my coffee, and where am I going to get my lunch?” Robert recalls. The new machine—chosen by resourceful (and highly caffeinated) employees—takes care of the former, while employees can walk to Artefino for the latter or drive to nearby Slyman’s, Superior Restaurant, Danny’s Deli, or AsiaTown. Each of the three floors offers a private meeting space—each themed by a different GBX project. For instance, the Catahoula Room is named for the Catahoula \Hotel in New Orleans; the Julian Room for a project done in Columbus; and the Powerhouse Room as a nod to work GBX and Jacobs Group did to transform the Powerhouse into the Greater Cleveland Aquarium. On the top floor is the Crown Room—a more relaxed space dedicated to GBX partner Kevin Czerwonka, who passed away in 2016. The room is adorned with a painting by his favorite artist and bottles of Crown Royale, his favorite drink. Despite being housed in an old structure, GBX has installed state-of-the-art technology throughout the building. From smart lighting to security systems that log who comes in and out to parking access controls, Robert says today’s technology eliminates the need for a front desk. On the lower floors, the above-ground basement is used for storage and houses much of the building's mechanical workings, says Robert. The first and second floors have been fitted with the same noise-mitigating membrane, then covered with a thin layer of concrete to level them. The floors will then be covered with wood or carpeting, and the exposed ceilings will be painted. Robert says they want to leave the spaces a “blank canvas” for potential tenants. They are hoping to fill the second floor with a shorter-term lease tenant, so GBX can use that floor for future expansion. Swentor says their project at 2101 Superior has sparked interest in the other buildings GBX owns in the district. In addition to owning 10 buildings, the company also owns five parking lots and helped to develop three other buildings: the Tower Press building across the street at 1900 Superior Ave., the S. Korach Company building at 2400 Superior Ave. (home to Red Space and Hot Cards), and the MT Silver building at 2310-2320 Superior Ave. (which is now 2320 Lofts). With the completion of the GBX building, the future proposed bike lanes along Superior, and the designation as an arts improvement district, people are starting to take more interest in the neighborhood. While GBX strives to energize the Superior Arts District, there is one point Robert, Sparacia, and Swentor are clear on: They do not intend to displace current tenants or make rents unaffordable for the many artists and makers who occupy the many old warehouses. Sparacia cites Superior Sound and Tiny Tots Daycare as two tenants who are critical to the district, and he says GBX plans to keep their rents affordable. He says the same goes for the many artists with studios in the ArtCraft Building, which GBX also owns.